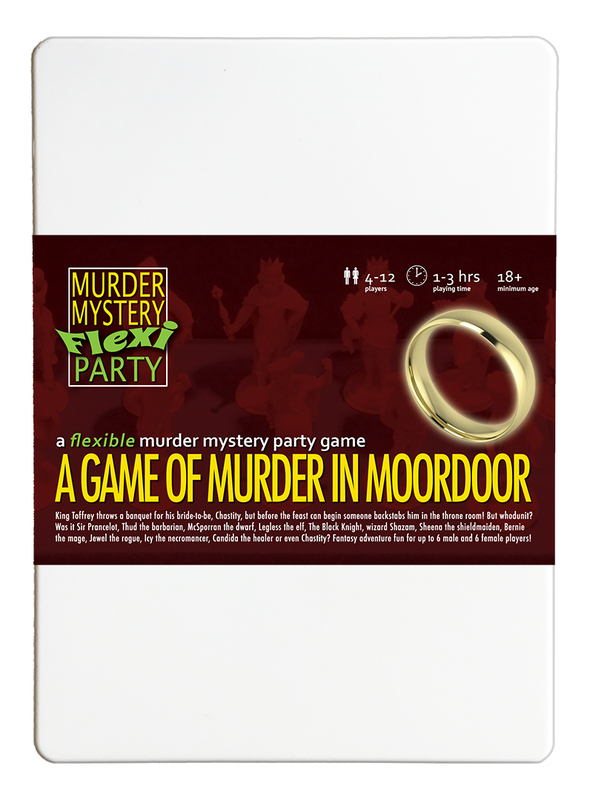 A Game of Murder in Moordoor - �.99 delivered. Young, cruel King Toffrey is stabbed with a dagger in the throne room, but which of the unlikely band of revellers did it? Gather round the great fireplace with knights and ladies, sorcerers and thieves, elves, dwarves and dragon-slayers, and embark on a perilous - and hilarious - quest to discover who slayed the king! NEW! - Email invitations. Visit the Murder Mystery Party website to view character bios, costume suggestions and invite your guests! *full instructions included in the tin. * Play with ANY combination of 4-12 guests. No-one is 'bolted on', everyone's a suspect. An excellent way to spend a role-playing evening with friends. Each party takes 2-3 hours to play. They are filled with intrigue, suspense, humour and the fun of playing both detective and suspect. This game is designed to be played by up to 6 male and 6 female players, in any combination (minimum of 4).